Bowron Lake Provincial Park is located in BC's Cariboo Mountains, 144 kilometres southeast of the city of Prince George and east of Quesnel. Take Hwy 26 from Quesnel, BC, to the community of Wells, a distance of 90km (55.8mi) and it is 30 km (18.6mi) by secondary road to the park from Wells. This magnificent 121 6000 hectare wilderness is characterized by a system of six major lakes and connecting waterways. The park contains a 116 kilometre canoe or kayak circuit consisting of Bowron, Indianpoint, Isaac, Lanezi, Sandy and Spectacle Lakes, the Bowron and Cariboo Rivers and a number of smaller lakes and streams, together with several portages. Bowron Lake and Bowron River were named for John Bowron who was a pioneer settler and early Gold Commissioner in the nearby gold rush town of Barkerville. This BC Provincial Park is a wildlife sanctuary and it is not uncommon for visitors to observe and photograph deer, moose, bears, caribou and mountain goat. Waterfowl and beaver are abundant in streams. The forest cover is mainly white spruce and alpine fir. Also found is lodgepole pine, western red cedar and western hemlock. The nearest community to the park is Wells, British Columbia, which is 90 kilometres east of Quesnel on Highway 26. From Wells it is 30 kilometres by secondary road to the entrance of the park. Also located near Wells is Barkerville, a restored Gold Rush Town of the 1860's. With its live theater in the summer and its numerous other attractions, Barkerville is well worth the visit. A variety of hiking and snowmobile trails exist in the Wells - Barkerville area, for more information on these or to plan a vacation visit Alpine Snow Ventures or Wells & Area Trails Society. Camping - This park offers vehicle accessible campsites at the Bowron Lake Campground on a first-come, first-served basis � campsite reservations are also accepted. There are 25 sites at the campground consisting of 3 doubles sites and the rest being single sites of medium size. The sites are shaded and parking is available for extra vehicles. The closest store is Bear River Mercantile, located about 1 km away towards Bowron Lake. There is no payphone in the park. If staff are not available when you arrive at the campground, choose your site and pay later. Boating - A boat launching site is located at the north end of Bowron Lake near the private lodges and a canoe landing float can be found at the campsite. Fishing - Indianpoint and Isaac Lakes usually provide the best fishing but all lakes and streams contain rainbow trout. Dolly Varden, lake trout, Rocky Mountain whitefish and kokanee are also present but don't count on catching fish every time. Depending on the season, the fishing varies from poor to excellent. Shelter - Camping, cooking shelters and cabins are located around the circuit. The camping areas contain from five to ten tent spaces, pit toilets and fireplace rings. The shelters are basic log cabins with a minimum of equipment. They are intended for emergency use or to give a party time to dry out and should not be used instead of camping. Commercial Facilities - Near the park entrance are camping areas and two lodges which can provide canoes, boats, accommodation, supplies and meals. 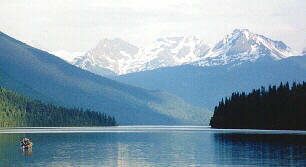 The lodges are Becker's Lodge Ltd. and Bowron Lake Lodge. 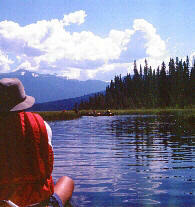 A list of canoe guiding operator's is available from the district manager's office. Reservations are compulsory for groups and recommended for all others. The circuit can be made anytime between June and October. July and August are usually crowded and September is when the deciduous trees are displaying their fall colours, making it one of the best times to travel the circuit. Visitors to the park have the option of completing the full circuit or for those who haven't the time or do not wish to complete the full loop there is the west side route on Bowron Lake to the head of Spectacle Lake. This is an easy journey with no portages. For more information on the circuit contact the address listed above. A canoe or kayak offers a noiseless approach to photograph wildlife but remember to keep your distance as moose have been known to attack when crowded or with their young. Be aware of bears at all times. For more information on safety around wild animals contact the local Region or District office nearest you. It is suggested that inexperienced canoeists do some practicing and conditioning before leaving home. The waters are periodically rough throughout the circuit and canoeists should be alert and prepared to paddle at all times. As situations change frequently, this information is not presented as accurate trip planning information and there is no guarantee of accuracy. DO NOT plan a vacation without first checking the above BC Parks website for ALL accurate and current information.